Prepping for May 15 blastoff. We’re working up to a big public announcement around Mozilla’s upcoming summer campaign. D-day is Tuesday, May 15. The party itself will kick off June 23. What? MEET up, MAKE something cool and LEARN how the code behind the web works. When? June 23 – Sep 23, kicking off with a Global Weekend of Code. How? Organize a meet-up. Volunteer to teach. Or become a partner. Wiki: check out the Summer Code Party wiki. Communications: finalizing copy and messaging for the May 15 announcement, including press outreach. Partners: recruiting is in progress. Tumblr, CoderDojo and many others are on board, with lots more on the way. Join us. Events platform: In development, targeted for first phase release May 15. 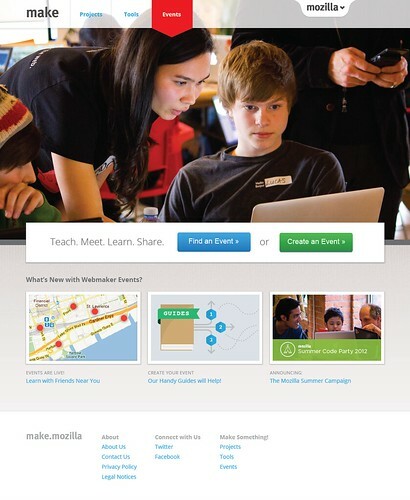 Will allow people to search for and add their own teach-ins, meet-ups and events. Get involved: Sign-up for reminders and updates.